Remanufacturing: A New Type of Manufacturing | Vista Industrial Products, Inc.
What do you mean a new type of manufacturing? Manufacturing is creating a product out of raw material, labor, machines, and tools. How can there be a new type? In recent years with the ongoing mindset to conserve resources and prevent waste, many companies are exploring the business of REmanufacturing; meaning taking a product that is no longer in use, at the end of its product life, or salvaged material in order to create a new or refurbished product.In a recent article, The Rise of Remanufacturing by Rajesh Krishnan, it mentions how the automotive, construction/mining, and aerospace industries have been taking a huge advantage of remanufacturing old/salvaged parts and make them useful to new and current needs. But if you think about it, there has been a lot of remanufacturing going on that many of us didn’t really think about like remanufacturing electronics and upgrading medical equipment. It has become a more pronounced industry that created a second-life business model that is affordable to the end-user, profitable to the OEMs, and better economically. Now that there has been some buzz around the new terminology, it has become apparent that remanufacturing actually is becoming it’s own type of industry and there may be some large opportunities to capitalize from it. It is important to note that remanufacturing is not the same as rebuilt, recharged, recycled, repaired, restored, or reconditioned. They may be seen as synonyms, but that is completely incorrect. For instance, rebuilt products usually refer to auto parts, recharged is usually to do with imaging and printing, recycle pertains to destroying added value of a product and reducing it to its element value of raw material, repaired parts only have their defective parts replaced, restored and reconditioned parts are brought back to their original condition like antiques and not on a mass consumer level. Although remanufacturing has many benefits which make it very attractive, there are also some negative aspects of it as well. The largest obstacle is being able to forecast when products are to be at the end of their life cycle and being able to create a new pipeline for the products to re-enter the product life stage. Since many companies do not plan for the life cycle, the designing of the “reman” design, the logistics for the product to be remanufactured, plus the second product life cycle, it is hard to really forecast for the success of being in this new industry. Businesses within the industry also have to be cautious about not competing with themselves by marketing or selling remanufactured parts with brand new products at the same time. This can damage the business’ brand and impact overall sales. In addition, consumers have a negative perception regarding products that have used parts and feel the product is inadequate and not as durable as a brand new product. So it is important for companies within this industry to properly market and sell remanufactured parts that make the consumer realize the product isn’t defective or used, but a quality remanufactured part that cost less. Aside from the business and consumer obstacles of remanufacturing, it is also important to point out the regulatory obstacles. When remanufacturing, there may be issues with intellectual property of the product that is being remanufactured. There can also be obstacles of recycling unused materials from the original product that can fall under local, state, or federal laws. Here at VIP, we have yet to enter the remanufacturing industry because we generally manufacture parts using raw material. However, this is an industry that is definitely gaining some ground in the fabrication world and shouldn’t be ignored. Currently, VIP specializes in manufacturing parts for the defense, commercial, medical, and high tech industries. 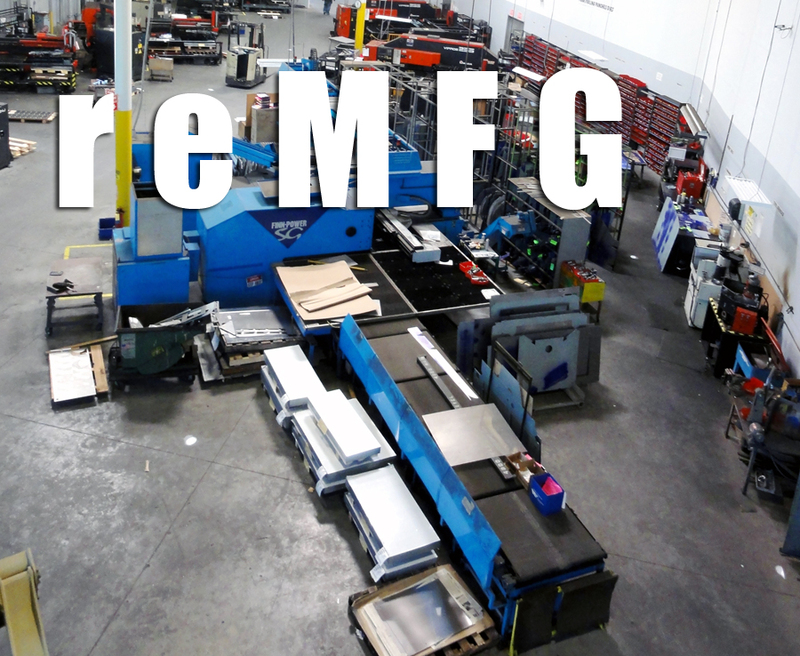 Products range from small machined parts to large sheet metal cabinets. No matter the size or quantity, we are known for our high quality metal fabrication. Our in-house facility has various equipment and technology to perform some of the most difficult metal fabrication requirements. Whether it’s sheet metal, machining, welding, mechanical assembly, or metal finishing, VIP is a one-top-shop for all your metal fabrication needs. Please contact us today to for a quote or to learn more about our services. This entry was posted in MFG, Principles and tagged metal fabrication, new type of manufacturing, remanufacturing by Britney Blue (Payne). Bookmark the permalink.